AND THE WINNER IS #22 - SERENA! Congrats and thanks! Nice meeting all of you and I hope to see you around! It's time for the Ultimate Blog Party over at 5 Minutes for Mom and this year I thought I'd hop in. I've loved participating in things like Bloggy Giveaways as I've met quite a few of you that way. I look forward to making some new friends in this way. This is a book blog, pure and simple. Only it's not always purely about books and I'd like to think it's not all that simple. If I thought it were simple, I'd probably quit blogging. 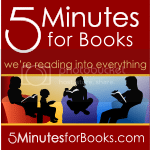 Besides running this site, I am also a staff member at 5 Minutes for Mom's sister site, 5 Minutes for Books. Being a part of that team is a joy and a delight! I love to read and I love to think. My husband will verify that I get antsy and anxious after a period of days if I haven't had a chance to read. I can't help it. I don't try to. Blogging seems to be my escape from the world and a chance to get my "mommy brain" some excersize. I am a stay-at-home mom who wouldn't want to be anywhere else, so I especially relish the joys of blogging and the book blog community that has been developing over the last few years. I'm blessed to have the opportunity to be home with my kid(s). I have one son and another on the way via adoption (due to arrive sometime this summer). My son doesn't have a blog name and he needs one. Feel free to leave a suggestion. ("Bookworm1" "Little Squire"? I don't know. Leave a thought!) I love that I get to pursue two passions: the passion to pursue homemaking as both an art and a calling and the passion to read and review books. My husband and I are also photographers in Oregon and we have fun working together to be creative in this particular art medium. We've guest posted a few tips and tricks over at 5 Minutes for Mom if you'd care to take a peek. There are a lot of things that drive and motivate us, but for me books have to rank near the top of things that have the ability to sway, shape and change my mind. They mature me. They speak for me. They engage me and I love them. I'm trying to instill the same love of reading in my children. One of the publishers that we've used in our home to encourage this love of the written word (as well as love of music!) is Barefoot Books. Barefoot books are quality - top quality - children's books. THey have a series that also includes music and one of our favorite is Knick Knack Paddy Whack. This particular book features SteveSongs singing the main tune. Each verse or round of the song highlights a particular musical instrument (maracas, guitar, violin, drums, etc.) in a tasteful and catchy manner. We love this book. Barefoot Books has agreed to give away one copy of Knick Knack Paddy Whack with a CD to one of you! I love their generosity and excitement in wanting to participate in this way and would encourage you, in turn, to show some excitement back to them by browsing their site. It's like a big treasure hunt over there! Then come back and tell me what you found! 1. Visit Barefoot Books and come back and let me know what you saw and liked. 2. 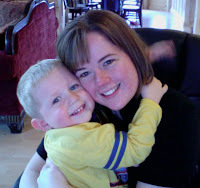 Win an extra entry by leaving a suggestion for a blog name that I can refer to my son as. 3. Win a THIRD entry by subscribing to me via Google Reader, e-mail or whatever! This contest is open to U.S. Residents Only. Winner will be announced on Friday, March 27th. I hope to get to know you also and am looking forward to running around the Blog Party and meeting some other attendees. Good luck, have fun and see you around! Great idea to try and teach your children the love of reading. I am pleased my son (now 12) is as addicted to reading as I am. I'm from Australia so am ineligible for your giveaway, but it sounds like a good one! I love your site. yes, I found you through 5MfM but you are on my blogroll. I have a passion for reading so I always enjoy your input. Swing by my site, The IE Mommy, to check out my Ultimate Blog Party Post. I am an avid reader, too. I can be a little obsessed in that once I start a good book I cannot stop! I'm planning to begin doing more book reviews on my blog. I love your site! I LOVE reading and can never get enough of it. I will be checking back again, thats for sure! I love reading , I am currently reading "The Secret Life of Plants"
Have you ever tried it , I would love have someone to compare reviews with when I am done. My daughter loves Bear about Town. I didn't realize there were others in the series. I will have to check those out. Thanks for the giveaway. I like seeing the pics! And having you part of the 5M4B team is a delight as well. We are a reading family. How about Bitty Book Biter? Party On! Nice to meet you, your family is beautiful! I love your list of books too, every single book looks interesting to me. Nice to meet you. I'm a SAHM to a three year old daughter and one on the way due anytime. Reading is a big deal in our house. I have two blogs but am participating with my book blog, Teen Lit Review. I have visited 5 Minutes for Books in the past. I stopped by Barefoot books and loved that they started as a homebased business. I loved the activity books. I'm interested in homeschool, and those books sound like they'd be great resources. As for a name, my daughter goes by Scamp, so how about Reading Rascal for your son? I'd love it if you stopped by. I am a book obsessed Mommy and I love Barefoot books. People sometimes get overwhelmed with all of the books we have in this house. I am stopping by from The Ultimate Blog Party to check your blog out and subscribe. What a great week we are in for! I love the barefoot activity books! So fun! I would choose any of the items/books in the One World, One Planet section. i am remarkably saner when i'm in the middle of an absorbing novel. i read while i walk on the treadmill, and it's amazing how those miles fly away when i'm lost in a story. we have a ton of children's books at our home, and i'm actually working on weeding through them and making better use of the treasure trove that is our local library, so no need to enter me in your contest...but for the record, barefoot books (and everything they publish) seriously rocks. I also really enjoy reading, but probably not as much as you! I love the family photo. I love to read, my daycare kiddos love to be read to. Books are one of the things I tend to purchase without hesitation. We get so much use out of them. I am in a reading circle with my mom, and my aunts. The Aunts live 400 miles away and we mail books back and forth. You have a wonderful site, and I love the Blog Party, it has been so much fun. Thanks for inviting us to stop at your blog. I am a bibliophile as well and am always reading five books at once. LOVE the family portrait. Just beautiful. Found you through UBP09. Children's Literature was my favorite course in college when finishing my B.A. in Education. I would love to win this book for my nephew in Michigan. Oooh! Everything is so great! "We're Riding on a Caravan" looks lovely. I like the activity pages they have to go along with some of the books! I think nicknaming your little guy "Bookmark" might be cute, because children DO tend to cause you to use bookmarks rather often! I subscribe to your feed, as well. Brea loves fairies so I would go with "Barefoot Book of Faeries" Thanks so much for the giveaway. I would also like to invite you to participate in my Show off your blog Saturday linky. I would love to check out your favorite post! It must be fun to read and review books. I love to read and I also write. Have fun at the parties and I hope you have a chance to stop by. Hi, stopping by all the blogs in the party that I can get to. It's very nice to meet you and your blog! With how many blogs in the party right now, that is 254 blogs per day for 4 days! Wow! I like the Barefoot Book of Faeries. We are obsessed with faeries. oh I wish I had more time to read - I guess if I read less blogs I would have more time!! It is great to hear about your love for books.. especially the idea of passing that on to your child! I love books, so your blog looks really interesting! Happy partying!! Happy UBP 2009!!! Beautiful family. I'm liking the ABC's and 123's set. It's great to meet you! What a wonderful blog. Hope you have a wonderful bloggy party! Barefoot Books are such high quality! Always gorgeously illustrated. I'm a huge fan. how about prince periodical ? Thanks for hosting a blog party! I love to read too. Although I have been reading mainly for pleasure and escape recently and not to grow and learn. I look forward to getting to know you better. You don't need to enter me for the contest, but I just wanted to pop in and say Hi while party-hopping. :-) You're in my husband's neck of the woods -- he grew up in Idaho. I love to read,too! I'll have to come by again and see what you're reading. Party Hopping and loved the Barefoot Books Activity Books - looks perfect for just throwing in the bag for long waits at the doctors or in line! Thanks for the giveaway and Party ON!! Party hopping! I will be back to enter your giveaway at some point! I love the way you designed your blog. Nice! Nice to meet you. Happy partying! I never noticed before that Little Bear's favorite book, WHO ARE YOU, BABY KANGAROO, is a barefoot book! We took it out of the library some time last year, and Little Bear and Pufferfish loved it so much, I ended up buying them a copy! The illustrations are so beautiful, and its like a regular little kid story (repetitive, basically, which is what they love) but educational too because it teaches the names of baby animals and the countries they come from. I would recommend it to anyone! I love the ABC's and 123's set of Barefoot books. I like the Tales of Old Ireland. Visiting from the UBP. Love your blog. I love to read and can't wait to visit more of your site. I'll come back later to do the other stuff! 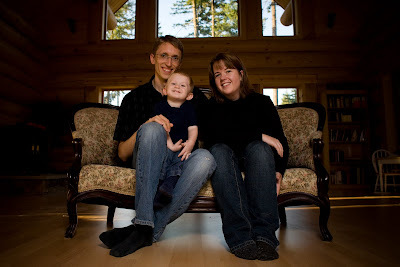 Lovely blog and lovely family. The family portrait is really fantastic. Good luck with the adoption. I am sure you are waiting with bated breath for that next little one! How exciting! Come by and visit my place if you have time and check out my Etsy store. I have some really fantastic flashcards that would be wonderful for your little one (whi is adorable, btw). If you are interested, email me and mention UBP and I'll give you a 15% discount. Great site! I love books, and am always looking for great recommendations. Thanks for the referral to Barefoot books. I like that they have a section dedicated to Earth Day, which my son and I will be celebrating for the first time this year! I love to read and hope to pass on this love to my kids. Thank you for your blog!